The Plexstar XC1610 is a feature-rich, compact highly integrated central cross-connects. The XC1610 includes multi-rate SONET/SDH interfaces (4 x STM-16 or 10 x STM-4/STM-1) or (4 x OC-48 or 10 x OC-12/OC-3) with full section, line and high-order path processors. The XC1610 also contains 140G of non-blocking memory-based high-order STS/AU cross-connect, 20G low-order VT/TU path processors, 20G of non-blocking memory-based high/low-order cross-connect, a system-side interface consisting of ESSI serial links (8x2.488Gb/s or 622Mb/s). The XC1610 is configured and managed by web based feature rich GUI. It fully complies with US telecom standard. The XC1610 enables power-efficient equipment design with unprecedented scalability and carrier grade reliability. Offers 4 x SFP for SONET/SDH (STM-16/4 or OC-48/12). 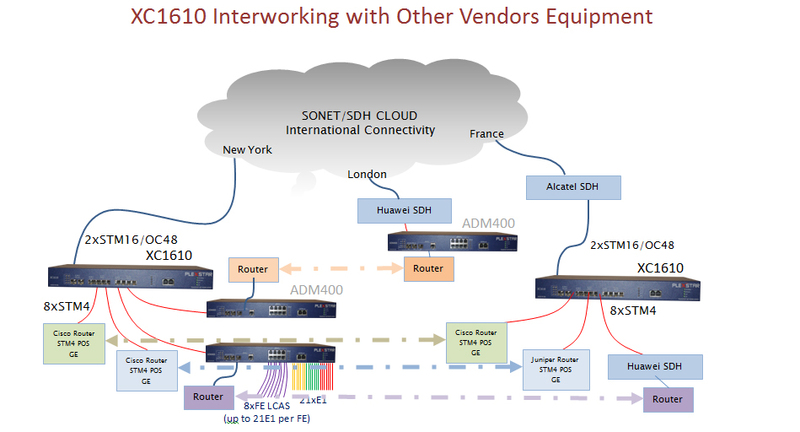 Offers 10 x SFP for SONET/SDH (STM-4/1 or OC-12/3). Unidirectional Path Switch Ring (UPSR) architecture as single XC1610. North/South and East/West SONET/SDH ring. MAPSTM automated protection switching, a mechanism that allows standards-based protection switching without software intervention. Linear Automatic Protection Switching (APS). Low power consumption (40 Watts) and cooled by software controlled fans. SMC or SEC compliant timing synchronization with ability to time from line, BITS. Additional web based secured control and status monitoring support. XC1610-STM-16 for Asia, Europe and other regions. Four OC48/12 or STM16/4 via SFP. Ten OC12/4 or STM14/1 via SFP. Eight OC48/STM16 via SATA connectors. Two (1000/100) RJ45 Interface for LAN and Console. Power 110/220V AC or -48V DC. Higher-order and Lower-order POH, SDH/SONET Level. Remote software downloads and FPGA reconfiguration. Various local and remote loop-back. Supports timing synchronization options from the SONET/SDH lines, BITS interface an internal reference. A combination of a digital PLL and an analogue PLL is used to meet the system requirements for synchronization, holdover and jitter. SONET/SDH cross-connect solution in a compact 1U chassis. Supports grooming up to TU11/VT1.5.